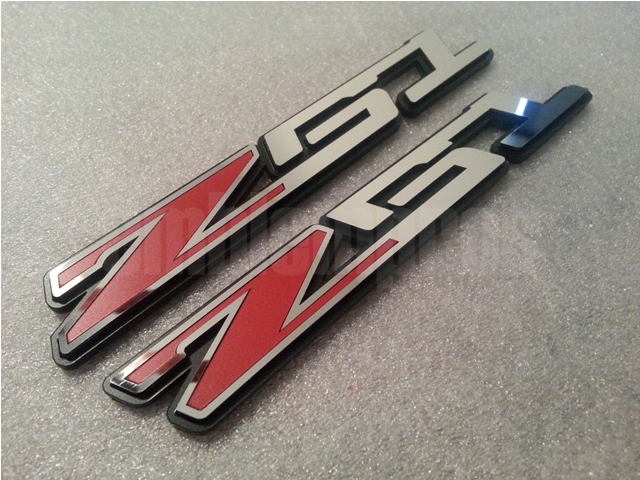 This is a set of two (2) Z51 emblems for your C7 Corvette styled after the C7 Z06 emblems. The "5" has the break in it just like the "0" in the Z06 emblem. These are also side specific. One slants forward, and the other backward. Place them how you think they'll look best. These are laser-cut from mirror stainless steel and UV-Rated plastics. The emblems have a flat black base and the stainless parts are bonded to the base with 3M double-sided automotive tape. We also give you the choice of selecting your own color for the "Z" fills. Red and black are the colors shown. If you would like a 3rd emblem for grille installation or rear bumper cover placement, we have included an option to add that below. These have 3M double-sided tape pre-applied to them for installation. Simply clean your car and place these where you want them. These emblems are approximately 6" long. These emblems look GREAT on the front quarter panels of my black C6. You have the option of slanting them forward or aft when you install them. I did mine forward. These emblems are very high quality and I highly recommend them.